Associated Press Butler's Joey Brunk goes to the basket against Creighton's Ty-Shon Alexander, left, and Samson Froling on Saturday. 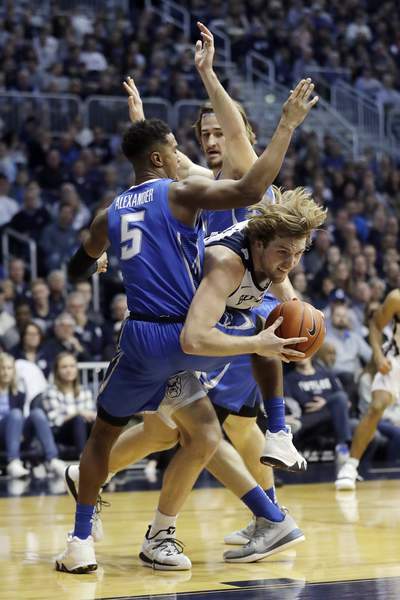 INDIANAPOLIS – Kamar Baldwin scored a season-high 28 points and Butler defeated Creighton 84-69 on Saturday to end a two-game skid. Martin Krampelj had 16 points and eight rebounds to lead the Blue Jays (10-5). OLIVET 81, TRINE 70: In Angola, the Thunder battled back from a 15-point deficit in the second half and pulled to within five points late but could not get over the hump. Olivet (5-8, 1-1 Michigan Intercollegiate Athletic Association) shot 56.9 percent for the game. Senior Myles Copeland led Trine (8-5, 1-1) with a game-tying high 25 points and had seven rebounds. SPRING ARBOR 61, HUNTINGTON 57: In Huntington, the Foresters gave up a seven-point halftime advantage and shot just 35. 9 percent from the field. Caleb Middlesworth led Huntington (12-6, 2-4 Crossroads League) with 19 points on 7 of 18 shooting. Konner Platt added 16 points. TAYLOR 75, SAINT FRANCIS 72: In Upland, the Cougars' eight-point halftime lead quickly dissolved as the Trojans came from behind. Connor Lautzenheiser scored 20 points on 7 of 17 shooting and Austin Compton added 15 for Saint Francis (10-8, 3-3 Crossroads League). Mason Degenkolb led Taylor with 33 points on 13 of 17 shooting. MOUNT VERNON NAZARENE 86, GRACE 78: In Winona Lake, Grace's 19 second-chance points weren't enough to take down the No. 5 ranked team. Charlie Warner went 8 of 14 for 19 points, and Haden Deaton added 18 points in the loss. Grace (11-7, 1-5 Crossroads League) shot 41.38 percent from the field. HANOVER 88, MANCHESTER 69: In North Manchester, Adrian Johnson scored 29 points in a loss for Manchester (5-8, 2-4 Hoosier Collegiate Athletic Conference). UM-DEARBORN 84, INDIANA TECH 69: In Dearborn, Michigan, UM-Dearborn scored 25 points off 11 Indiana Tech turnovers to defeat the No. 13-ranked Warriors. Dylan Phair led Indiana Tech (11-8, 7-2 Wolverine Hoosier Athletic Conference) with 24 points. Josh Kline added 14 points off the bench. INDIANA STATE 65, BRADLEY 60: In Terre Haute, Christian Williams scored 18 points with 11 rebounds to lead the Sycamores. Williams was just 3 of 12 from the field but sank 11 of 14 foul shots for the Sycamores (9-5, 1-1 Missouri Valley Conference) who were 30 of 47 (64 percent) from the line overall. VALPARAISO 82, MISSOURI STATE 66: In Springfield, Missouri, Ryan Fazekas scored 18 points and the Crusaders used a big first half to roll to the Missouri Valley Conference road victory. Fazekas was 6 of 11 from beyond the 3-point arc and Bakari Evelyn added 13 points off the bench for the Crusaders (9-6, 2-0). Jarred Dixon finished with 23 points for Missouri State (6-9, 0-2). INDIANA TECH 62, UM-DEARBORN 56: In Dearborn, Michigan, a big third quarter gave the Warriors a 16-point lead that helped them hold off a furious rally by the hosts and win their 16th straight game. Alexis Hill led Tech (17-1, 9-0 WHAC) with 20 points and nine rebounds. DeAnn Kaufman added 17 points and Bella Lozano-Dobbs had 11 rebounds. TAYLOR 72, SAINT FRANCIS 54: In Upland, the Trojans nabbed their fifth victory over a ranked or receiving votes opponent. In a game that Taylor (13-4, 4-2 Crossroads League) never trailed, Kendall Bradbury scored a game-high 25 points including her 2,400th career point. The Cougars (11-7, 3-3), who played without injured leading scorer Kara Gerka, were led by Sidney Crowe's 14 points. GRACE 60, MOUNT VERNON NAZARENE 55: In Winona Lake, the Lancers (10-8, 4-2 Crossroads League) won despite a poor shooting performance. Grace shot just 35 percent, including a chilly 3-of-19 (16 percent) from the 3-point line. Vironnica Drake and Brooke Sugg powered Grace with Drake scoring 18 points and Sugg scoring 17. TOLEDO 65, BALL STATE 58: In Toledo, sophomore forward Oshlynn Brown led the Cardinals (5-8, 0-1 MAC) with 15-points and nine rebounds. Sophomore guard Maliah Howard-Bass chipped in 12 points. PURDUE 71, MICHIGAN 70: In West Lafayette, Dominique Oden's layup with 25 seconds left lifted the Boilermakers (11-5, 2-1 Big Ten). She finished with 26 points. Homestead graduate Karissa McLaughlin added 10 points. TRINE 82, OLIVET 42: In Olivet, Michigan, Trine (12-2, 5-0 MIAA) nearly doubled up Olivet in the dominating win. Cassidy Williams and Tara Bieniewicz had 13 apiece to lead Trine. Sophia Kreag added 12 points. HANOVER 84, MANCHESTER 53: In North Manchester, the Spartans (2-11, 0-6 HCAC) committed 25 turnovers, which turned into 32 points for Hanover. Faith-Alexis Graham and Bridget Nash had 10 apiece to lead Manchester. HUNTINGTON 67, SPRING HARBOR 55: In Huntington, Sarah Fryman's 28 points led Huntington (10-7, WHAC 3-3) to its sixth straight win. A 13-4 run in the third quarter gave the Forester's an 11-point cushion. Brooke Saylor and Erin Mohr added 12 apiece in the win.